The community of Riverside, Illinois was planned in 1868 by Frederick Law Olmsted to be purposefully different from the bustling nearby city of Chicago. Olmsted, famous for his design of Central Park in New York City, envisioned sweeping, curvy roads that hug the Des Plaines River – a stark contrast to the harsh grid of Chicago. 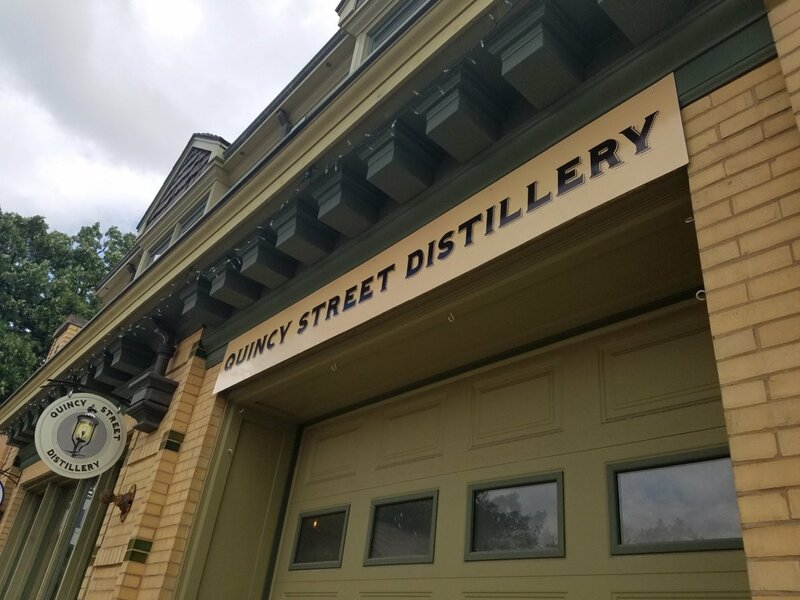 Today, nestled into the quaint downtown of the National Historic Landmark village is Quincy Street Distillery. 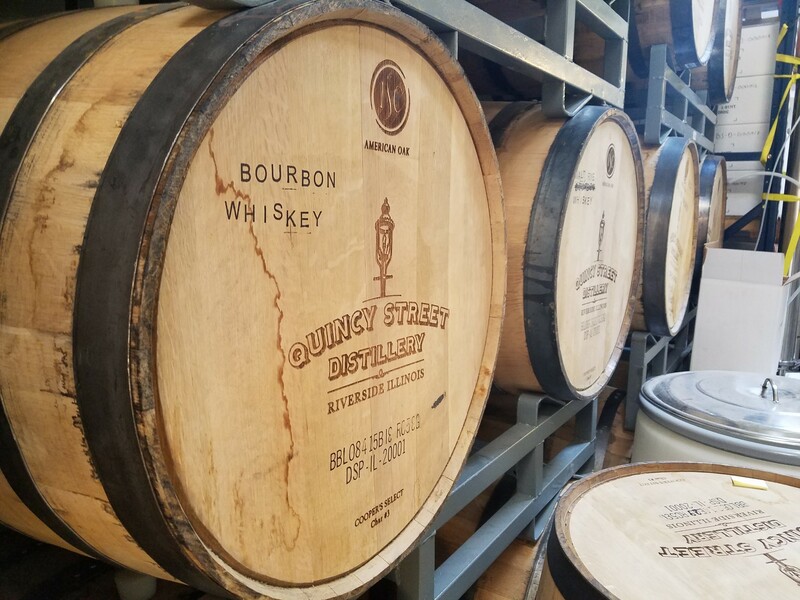 Fittingly, Quincy Street aims to revive history at each step of their process, from the mash bill to the label. We recently had the chance to take a tour of the distillery with founder and distiller Derrick Mancini. Derrick has a background in both science and history, so his tour featured highlights from both fields. Owner and distiller Derrick Mancini kicking off the distillery tour next to his still. 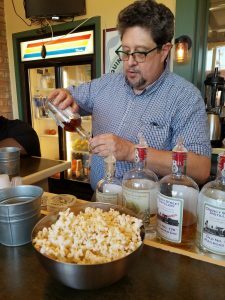 “You’re going to get a little mini course in how to hand make whiskey like they did in the 19th century,” he began. Quincy Street’s bourbon mash bill is a bit unusual today at 84% corn, 7% rye, and 9% barley, which is said to be typical of an early 19th Century recipe. 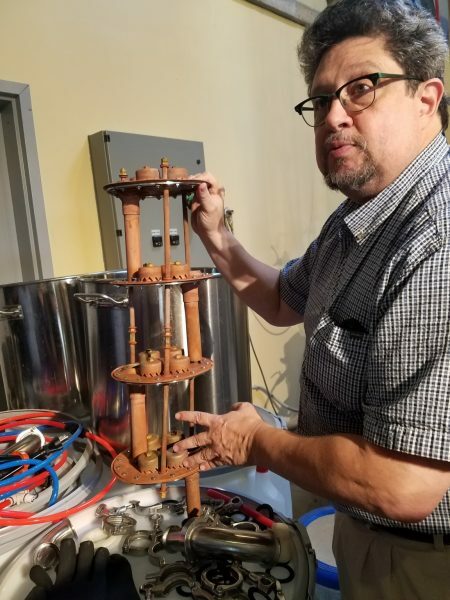 While early distillers may not have understood all of the chemical reactions in fermenting, Derrick does. 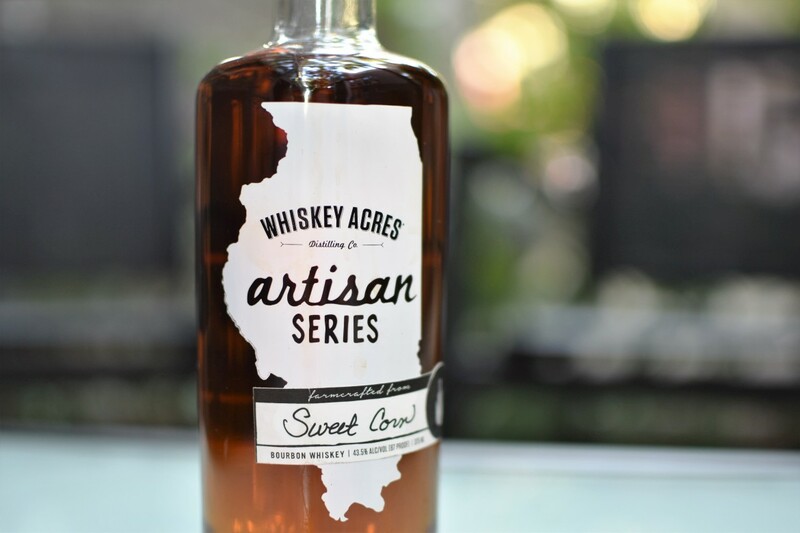 Whiskey mash begins with grain – and only grain – and that mash must be converted into sugar in order to feed the yeast. The mash is heated and then allowed to rest. The first rest, the alpha rest, allows the starches to be converted into complex (dextrin) sugars. Then, the temperature is lowered for the beta rest stage so that the complex sugars can be converted into simple (glucose) sugars. These are the sugars that yeast will consume. It is at this point that the yeast is added and the mash is allowed to ferment for 3-4 days. The result is distiller’s beer, meaning that the solid grains have not been filtered out from the liquid. Next, the distiller’s beer is fermented. Quincy Street twice distills through their high hat style still with onion condenser. 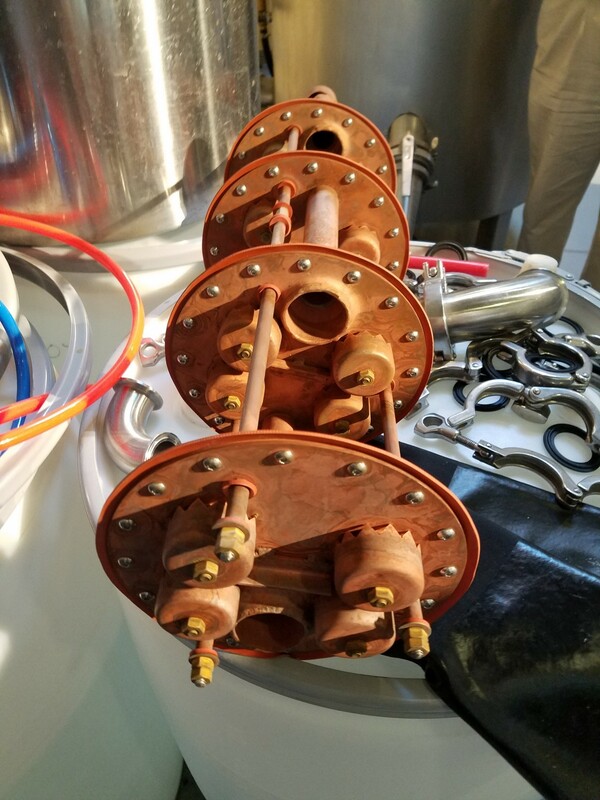 The first distillation is the stripping run to separate the liquids from the solids and results in a spirit around 100 proof. The second is the spirit run which actually defines the characteristics of the final product. The still includes a small column still atop the main pot. The column still is used to increase efficiency of distillation. Each section inside the column acts almost like a mini pot still. As the vapors rise through the column, they condense at a higher and higher proof in each section. Thus, it takes fewer runs and/or a shorter distance to distill at a given proof. Derrick demonstrated how a column still functions like a series of pot stills. Up close with the copper plates of a column still. 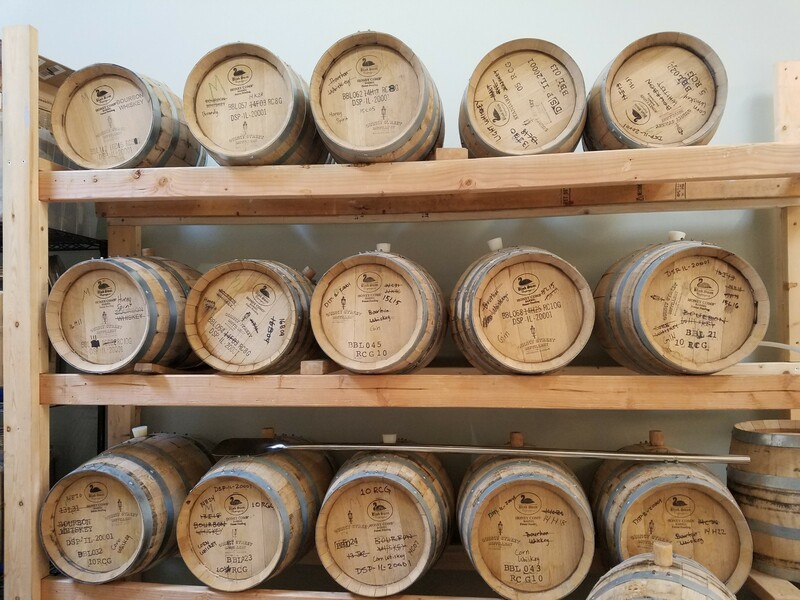 Quincy Street uses several different varieties of barrels for their aging. 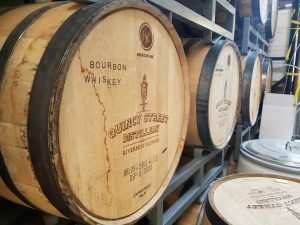 They have full size 53 gallon barrels made from Ozark white oak and supplied by the well-known Independent Stave Company. They also use small 5 gallon barrels with a honeycombed interior from Black Swan. This honeycombing has two effects. Most obviously, it increases the surface area of the interior of the barrel, allowing more of the spirit to come in contact with the barrel. More interestingly, it also means that the spirit comes in contact with wood without such a heavy char. When the barrel staves are charred, it is unlikely that the flames will char the insides of the honeycombing to the same degree as the smooth interior of the barrel. 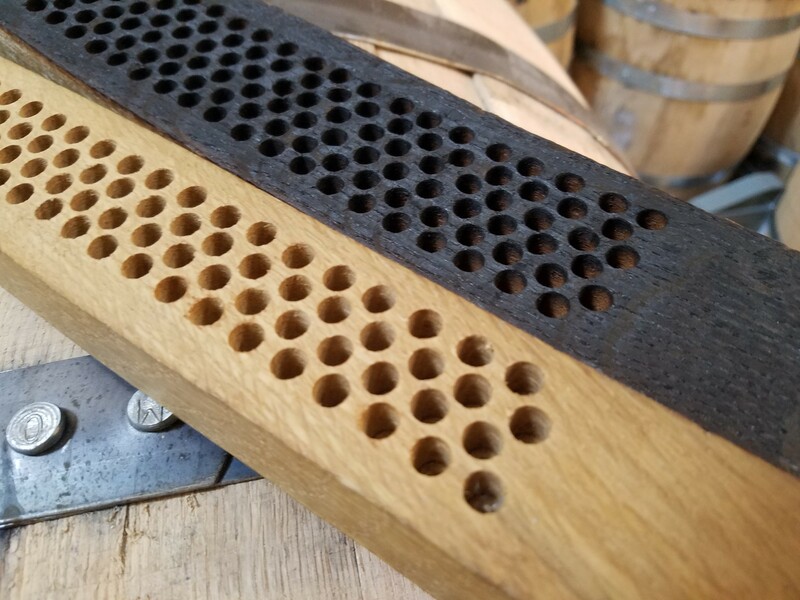 Thus, when the spirit flows into the honeycomb, it is interacting with either a lightly charred or even uncharred portion of the barrel. In other words, the spirit is mingling directly with the toasted stave rather than first traveling through a layer of char. 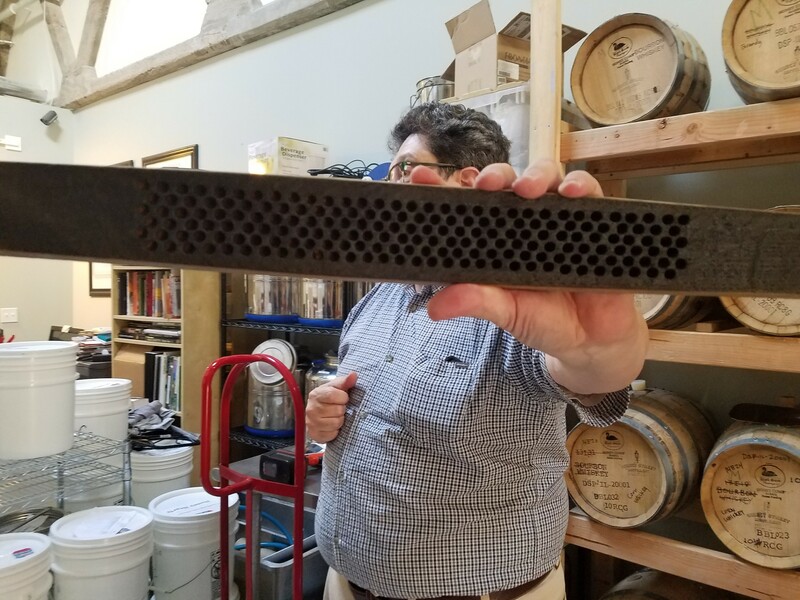 Derrick described how honeycomb staves affect the aging spirit differently. A close inspection reveals some uncharred wood inside the recesses of the honeycombing. 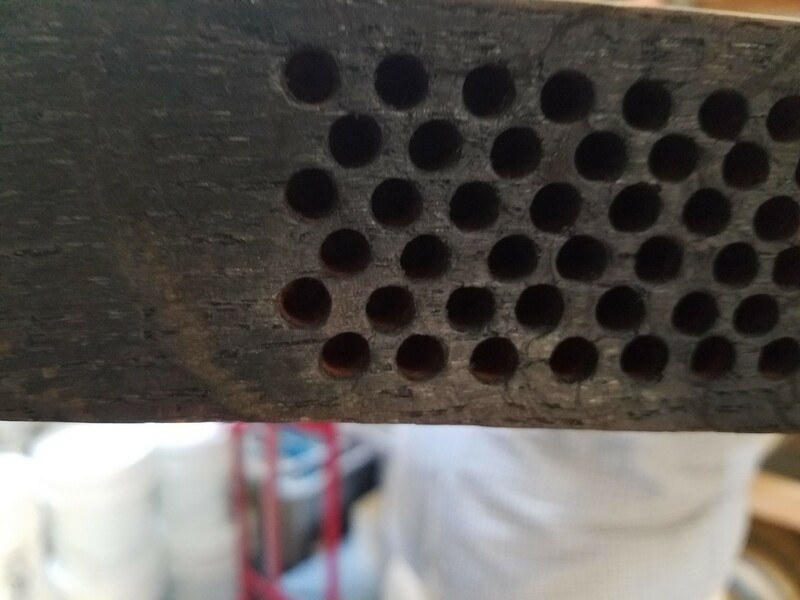 The honeycombed staves before and after charring. Again, the naked wood is visible inside the charred honeycomb. 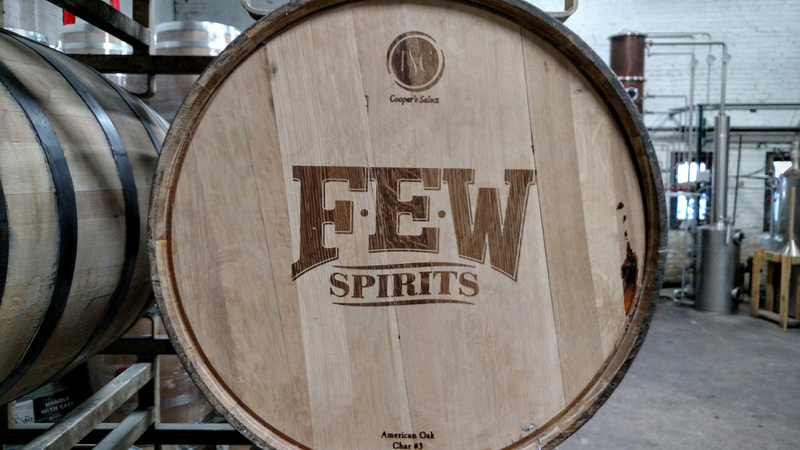 Derrick was quick to point out that more surface area inside a barrel does not mean the spirit will age faster. “You can’t speed up aging!” he stressed. While a spirit is in a barrel, three forces are at work: extraction, transpiration, and aging. Extraction is the process of pulling flavors out from the wood and transpiration is the process of whiskey going in and out of the barrel. Both of these can be hastened through techniques such as increasing barrel surface area or temperature controlling to create more “seasons.” Aging, however, is a chemical reaction that happens with the congeners, and that chemical process cannot be sped up. 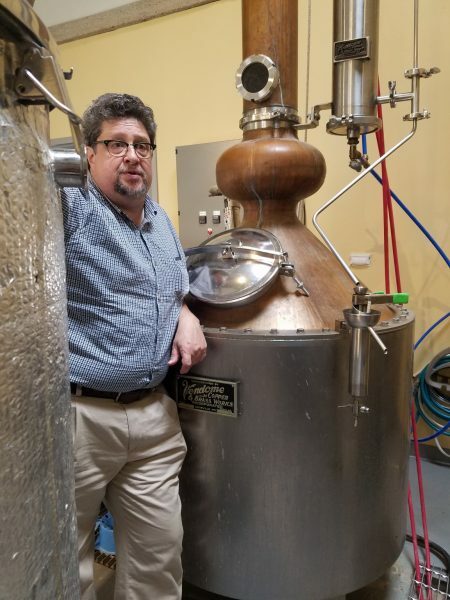 Derrick did add that the only process that “might, might” succeed at speeding up aging would be experimentation with UV rays in which some distillers are dabbling, since that would alter the chemical makeup of the whiskey. 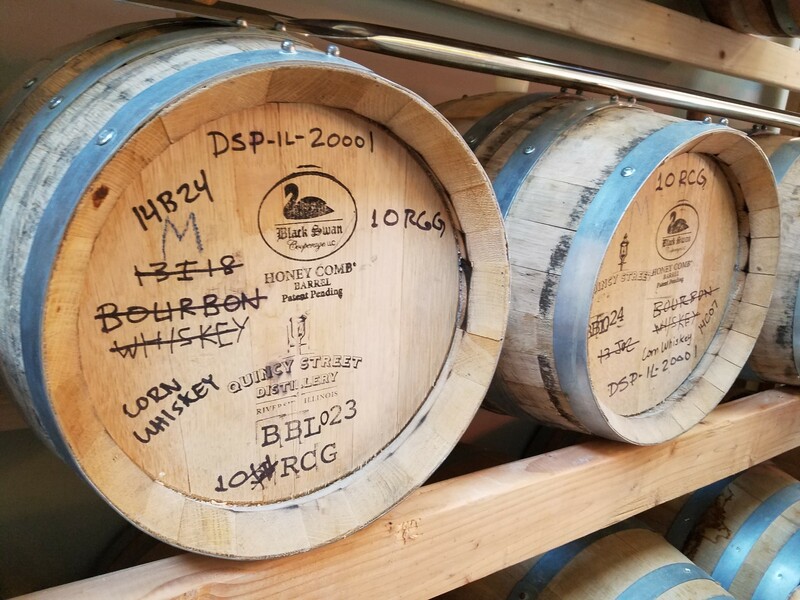 These full size 53 gallon barrels come from Independent Stave Company. A collection of smaller barrels are used (and reused) for various types of spirits. Some barrels have many lives. 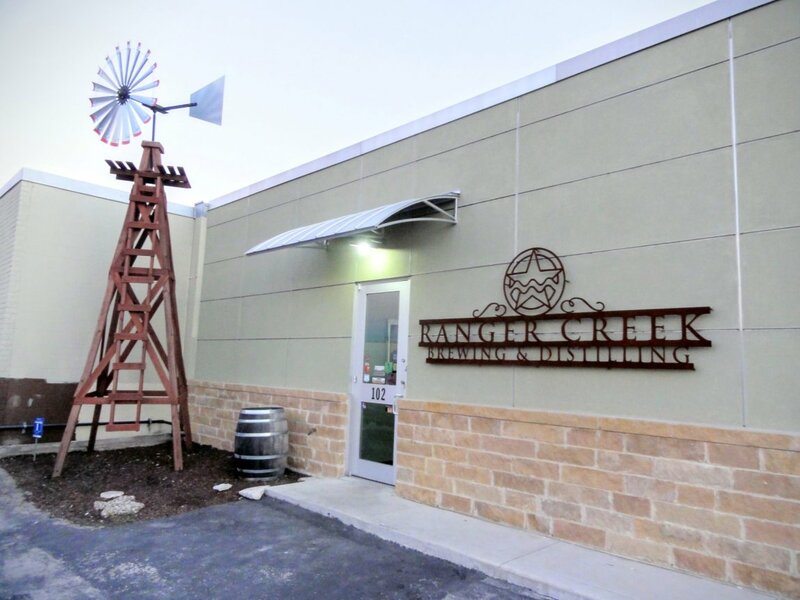 After the science and history filled tour, we headed to the tasting room for a sampling of the full product line. 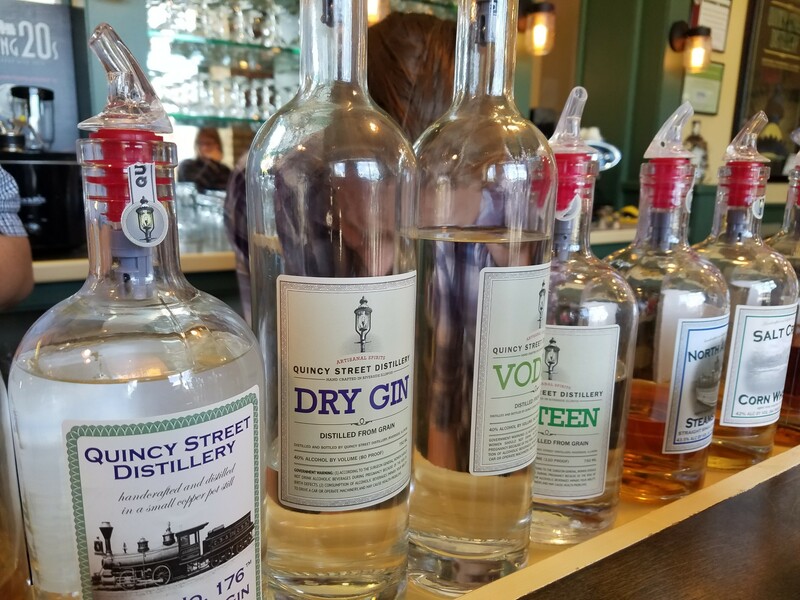 Quincy Street produces a variety of spirits including gin, vodka, poteen, malt rye, a honey spirit from distilled meade, and our personal favorite: bourbon. Bourbon Spring is a very young 3-4 month old bourbon that was aged in the honeycombed barrels. The tasting group agreed that the front is a little “in your face,” but the finish is surprising long with both smoky and wood notes. Also, Bourbon Spring is an actual place of historical note: it was the site of the tavern where the first Cook County militia was established (because important decisions are made inside taverns). Next, we tried the Laughton Bros. Illinois Straight Bourbon Whiskey, which is aged 2 years. “Caramel!” a fellow taster exclaimed immediately upon his first sip. This bourbon also has a surprising amount of maturity for its young age. The Laughton brothers, by the way, were the owners of the aforementioned tavern. 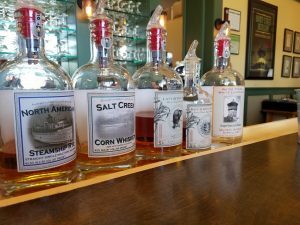 Some of the spirits sampled during tasting. Derrick pouring samples during tasting. 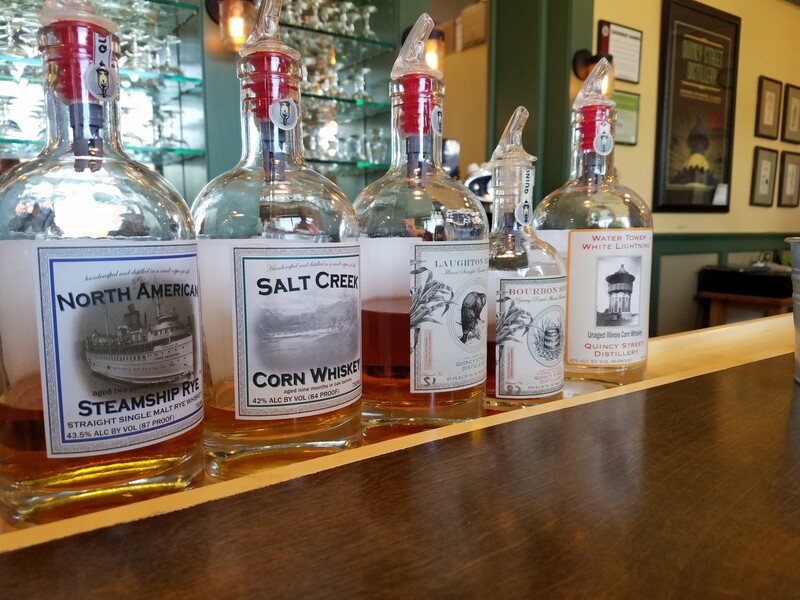 More of the spirits sampled during tasting. 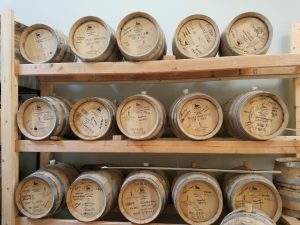 Lately there is a lot of discussion, blog posts, and friendly disagreements about just what exactly craft distilling means. “What a craft distiller should be doing, in my opinion” Derrick said, “is expanding the palate and giving more options for people to drink.” By that definition, Quincy Street is certainly succeeding. 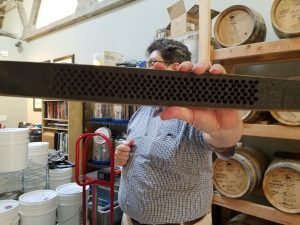 From its unusual bourbon mash bill to its honeycombed barrels, this distillery is producing some truly interesting products. We were delighted with the results so far, and look forward to tasting some older bourbons as they become available. 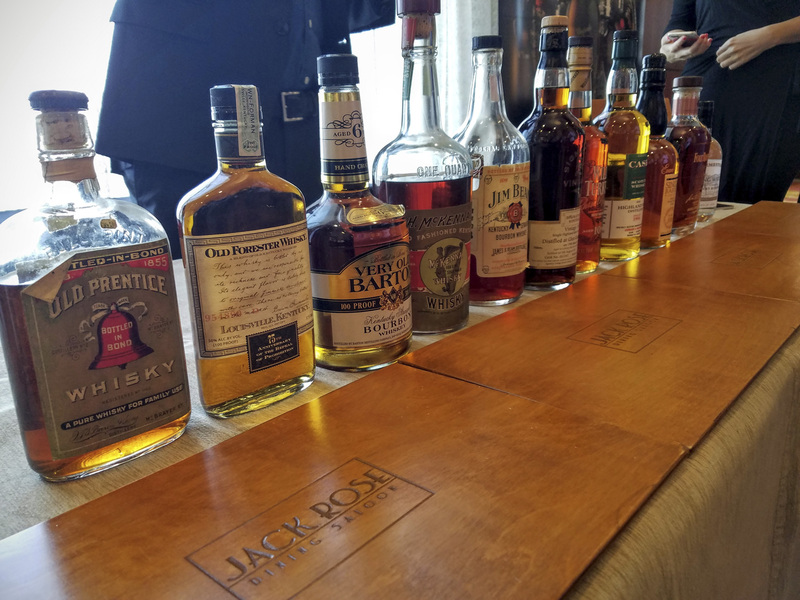 [Part 2] 2016 Kentucky Bourbon Affair & Whisky Live! Previous post The Whisky Extravaganza is Coming to Chicago!